The IRS has recently mandated changes to the way restaurants treat auto gratuity. For payroll purposes auto gratuity must be treated as a service charge. This means they must be tracked separately and are no longer considered eligible for a social security deduction. As a result of these changes we have introduced a number of changes to the way the BPA software tracks and reports gratuity and auto gratuity. 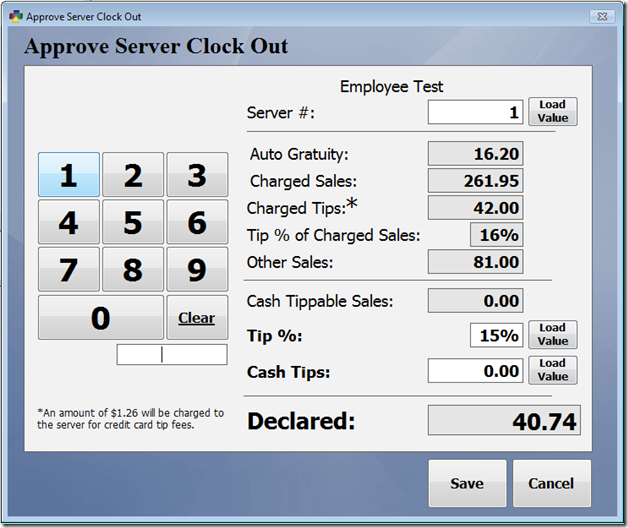 If the option is enabled for your server to claim tips when they clock out, you will notice some significant changes to the clock out screen. Gratuity and sales are now broken out into three separate groups. Auto Gratuity: This box reports any auto gratuity that was recorded on the closed sales. Charged Sales: This box shows any sales that were closed with a tip with a payment method of credit card, gift card, or placed on account. Charged Tips: This field reports any tips left on a sale that was closed with a credit card, gift card, or placed on account. 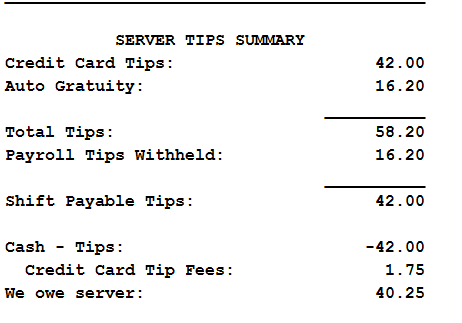 Tip % of Charged Sales: This percentage is automatically calculated based on the charged sales and charged tip amounts. Other Sales: Other Sales includes sales that were closed with auto gratuity or items that are marked to be excluded from gratuity. 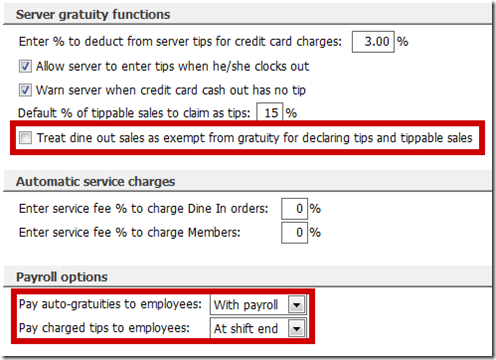 Because auto gratuity is not treated as a tip and is considered as wages, tips do not need to be claimed on this sales amount. Cash Tippable Sales: This field includes cash sales as well as any charged sales on which no tip was added. If no tip was added to a charged sale the system assumes the patron left a cash tip. There is an option to exclude dine out orders from this total which will be discussed later. Tip %: This field allows you to claim a percentage or your cash sales as tips. You may change this percentage by entering the percentage on the keypad on the left and then selecting Load Value. Cash Tips: Cash Tips is the amount of cash tips that you are claiming. This amount may be calculated by entering the percentage above or you may adjust this amount by entering the tip amount on the keypad on the left and then selecting Load Value. Declared: The declared field contains the amount of charge and cash tips claimed. The Misc. 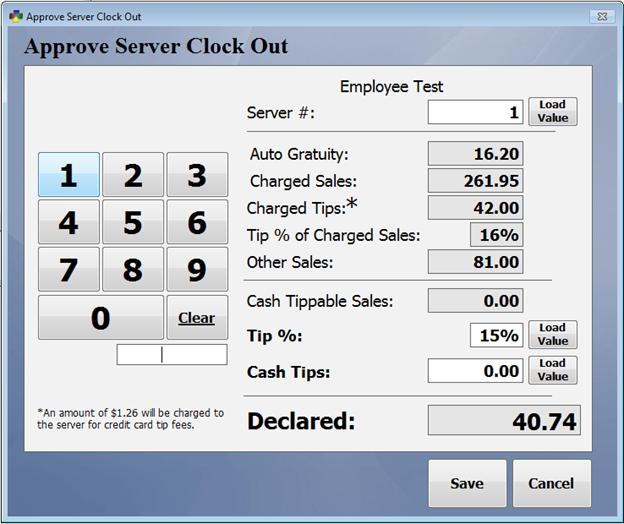 Definitions screen contains several new options that effect the way the software handles gratuity. To get to this screen, go to Restaurant System > Manager Functions > Misc Definitions. 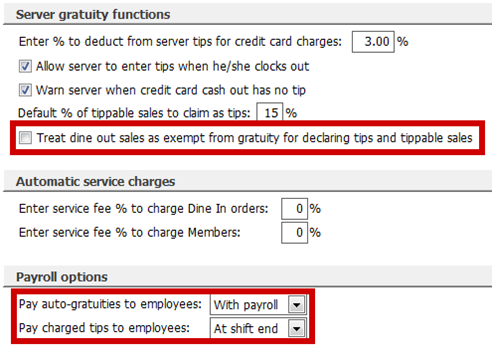 If you select the Gratuity option on the left side, you will notice several new options. First, you may choose to exclude dine out sales from gratuity and the tippable sales amount. If the majority of your dine out sales are pickup orders or you have an employee that handles dine out orders that is not paid a server’s hourly rate, you may want to check this option. You may also choose whether to pay out auto gratuity and charged tips at shift end or with payroll. If these options are set to pay at shifts end, the system assumes you will be paying out tips to the server from the cash drawer. If they are set to pay out at payroll, the system will report these tips to pay at payroll on the Daily Sales and Tips Report and the Time Clock Report. If you are using the BPA payroll module these tips will also be included in the payroll check. The Server Tips Summary section of the daily sales and tips report has been updated to show the changes outlined above. Payroll tips and tips paid at shift end are simply broken out so servers and managers may easily identify these amounts. The time clock report reflects these same changes making payroll reporting a simple process. Please note that updates must be applied to each computer running the BPA software. For assistance updating please call (801)336-3303 between the hours of 8:30am-5:00pm MST Mon-Fri.
It’s a new year which means it’s the perfect time to consider running your own payroll in BPA! The BPA Business System allows you to take full control of your own payroll processing. Move hours directly from the time clock, calculate taxes, and print checks directly from BPA. For only $75 a year you receive federal tax updates. If you are already running payroll or would like to get started, the 2014 federal tax table update for Business Plus Accounting is available now. This table is preprogrammed to work with the BPA software and allows the software to deduct the correct Federal Tax Withholding amount based on marital status and number of exemptions claimed. Call us at (801)336-3303 for more information. If you are just getting started with payroll in the BPA software please check out our payroll setup guides. These guides will walk you through making sure the system in configured properly as well and running your first payroll. Please make sure the following tax rates are correct in the BPA Payroll module as they are not included in the tax table update. These additional rate may be configured by going to Business System > Payroll > Change Federal Tax Limits. Rates below are from IRS Publication 15 as of 1/3/14. Please verify all rates listed. FUTA Tax Rate – 6.0% unless you take a credit against your state unemployment. Business Software Solutions does not provide updates to state and local tax information as this varies by state, county and sometimes even city municipalities. It is the customer’s responsibility to check with your local tax commission to verify local tax requirements and compliance. Customers who do not process payroll through Business Plus Accounting can disregard this update. The IRS has released updated payroll tax rates for 2013. The updated tax tables are now available for Business Plus Accounting customers. The tax table update is $75. To receive the updated files, please contact our sales department via e-mail at sales@businessoftware.com or call 801-336-3303. Social Security Payroll Tax Rates: The social security tax rate for all employees has now reverted to 6.2%. You can set this rate in Business Plus Accounting from the "change Federal Tax Limits" option in Payroll. You can get more information from our Updating BPA Payroll Tax Information blog post. This change should be implemented immediately. One of the great features of using BPA is the ability to run your own payroll rather than using and expensive third-party company. Below are guides that walk you through setting up the payroll module in BPA. Following these steps you can save your company money and allow you to take control of your own payroll. If you have any additional questions regarding setting up payroll in BPA please give us a call at (801) 336-3303.